We have 3 large dogs, a cat, and a bird. So, we occasionally have pet accidents. And we use Nature's Miracle by the gallon. But we recently found a new product - Clean + Green by SeaYu. These are eco-friendly, aerosol cleaning products. They have one for carpet/upholstery and another for wood floor/tile. When I first got the product, I was skeptical. But I decided to try it anyway as soon as one of my babies left me a little gift. WOW! With just a light spray both the stain and the smell disappeared! It seems that I had to use twice as much Nature's Miracle to clean the same amount of mess. And the smell was 100% gone!! I never ever found anything (other than scented candles) that covered up the accident smell so well! We tried the wood floor/tile one next. My elderly dog occasionally dribbles on the floor, so we needed a quick clean-up. Although the Clean + Green felt sticky when wet, it quickly dried. And the floor was so nice and clean that my husband decided to use it to clean the rest of the floor! The eco-friendliness of the product was just the topping on the cake. I would 100% recommend this product to anyone with pets. Now we aren't at all worried when guest come over... we invite them right in!! It looks like a normal, high quality dog bed. You are probably guessing that it came from L.L. Bean or Land's End, or some preppy boutique. Wrong! It came from West Paw Design, a fabulous eco-friendly dog supply store. The twill fabric is also "brushed", which makes it feel (almost) like you are petting a baby chick. You can even get it in a variety of colors! So even if you are being "green", you don't have to decorate all in green. PS. The cover is removable, for easy washing. Cause muddy pawprints will happen. Check it out here: West Paw Designs. Beds range from $64.00 - $178.00. But, really, you can't put a price on saving the planet! This Valentine's Day, check out these great gift ideas from The HSUS! This Valentine's Day, all you need is love—and these great gift ideas from The Humane Society of the United States. What would Valentine's Day be without the traditional bouquet of beautiful red roses? Their friends at Organic Bouquet have a stunning array of sustainably grown roses, all of which are either organic or ECO-certified. Order a rose bouquet today and receive a free vase, too! At Humane Domain, their online store, you'll find a fantastic selection of gifts for pet lovers. From shirts proclaiming your affection for your dog (or your cat's affection for you) to cute jewelry—like their delightful doggy heart-drop earrings—there's something to please everyone. And don't forget a "lovey" for your dog or cool catnip toys for your cat. If you and your honey like to celebrate Valentine’s Day with a nice glass of wine, be sure to include a bottle from the Dog Lovers Wine Club. Or give the gift of wine all year long by giving a wine club membership. Choose from several membership options and enjoy beautifully crafted wine label art month after month—always with a special message about the joys of dogs! Their celebrity kisses were so popular last year, they're bringing them back! With Zazzle's Sealed with a Kiss promotion, you can make sure every Valentine you write is sealed with a kiss. Their selection includes the luscious lip prints of Jenna Elfman, Persia White, Loretta Swit, Benji and more—all on real U.S. Postage. And remember, the best gift of all is love. Spend some quality time with your pet this Valentine's Day. So he must have these items! How cute are these?! 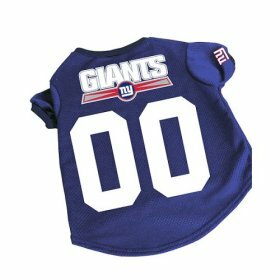 Show how you support the NY Giants at the superbowl this year by dressing your pooch in true football style. More of a recliner than a pet bed, It's like an Eames chair for your best friend. Bent ply with a choice of veneers. Solid wood legs. Removable, washable pad. Suitable for small dogs. Price: $599 CAD. Contact Vurv to order and for more information. 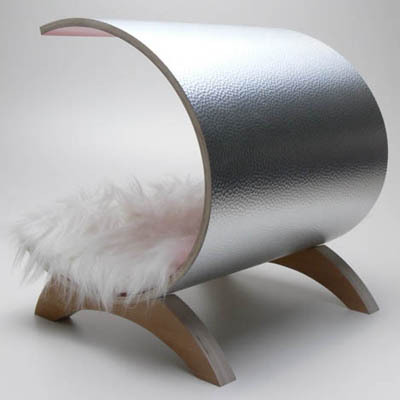 The dog pod is not just for dogs. It’s time to make your uber-rich poochie feel special. Give him a warm, comfy place to rest during those long drives with an SUV heated dog bed. This heated pet bed fits into the back of an SUV or station wagon and plugs into a cigarette lighter to relax your pet joint and muscle therapy during long drives. Recommended by veterinarians, low level heat improves the overall health and activity level of pets, and this bed reaches optimal therapeutic temperature in less than eight minutes using radiant heat. The bed is made of orthopedic foam padding protected by a waterproof liner and enveloped by a stain- and scratch-resistant rip-stop nylon cover that removes for easy washing. 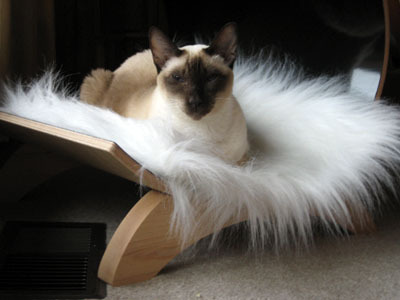 The soft bed is free of pressure points, providing your pet a smooth, comfortable ride. It includes adjustable side bolsters, allowing it to fit into any size SUV. Priced at $190. Find it at Hammacher Schlemmer. 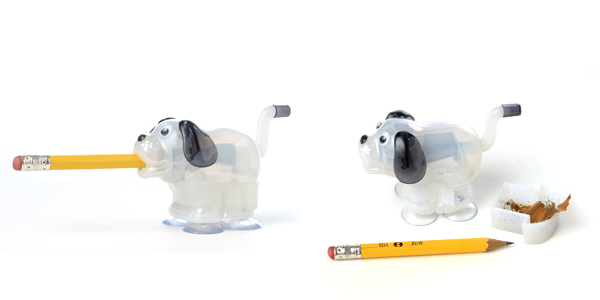 Can you believe this pencil sharpener! How funny! Buy it today at The Spoon Sisters. Hey, if I'm picking up dog shavings on a regular basis, at least I can get a sharpened pencil out of the deal! Furry Booty - Way to Go! We were all taking a stroll around Tompkins Square Park, when we ran into an adorable little dog named Gizmo. 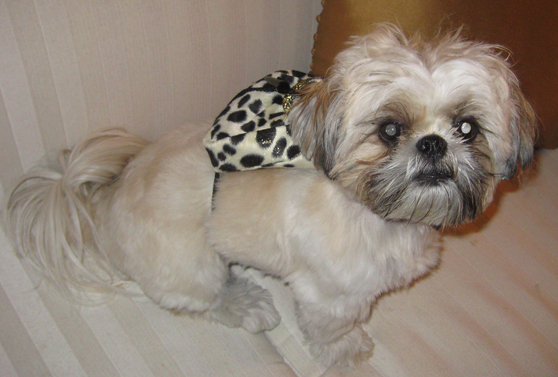 Being the fashionable hounds that we are, we were instantly jealous of Gimo's stylish backpack. The bags come in Animal Prints, Metallics, and also in Camo styles. A perfect gift for a dog birthday paw-ty or to spoil your own pup. All of us here in NYC are very busy people. Sometimes it is a bit difficult to get to the pet store, but we do it anyway because we love our pets. They deserve the best, and we give it to them. Well, Pet Net Direct has made it easier!! If you live in Manhattan or Brooklyn, they deliver your order to your house on the same day that you place your order!! How it works: You go to their web site. They have a large selection of supplies, from food to treats to brushes to weewee pads. They also have some pretty nice harnesses, and pet beds! And they have supplies for both cats and dogs. The food that they carry is top quality. You can order Merrick or Wellness as well as many other top brands. (And, maybe I shouldn't say this, but ordering from Pet Net Direct is actually a lot cheaper than ordering directly from the Merrick site!) You select a payment method, type in your shipping and billing info, and sit back. (Or use the free time to get a manicure, go shopping, or out to dinner with friends. Or take your dog to the park!) Later on that same day you should hear your doorbell ring and your supplies will be sitting there! Yippee!! Please note that if you order after 7 pm your order will arrive the next day. And if you order after 7pm on Saturday, your order will arrive on Monday, because they are closed on Sunday. Lexie Lew- Sylish Living, Pets Included. We know that furnishing an apartment can be a time consuming event. You want to find the perfect furnishings, rugs, drapery. You put it all together and it looks beautiful. It matches. And then there is the dog bed. That ugly thing in the corner. Even if it is stylish and expensive, it doesn't seem to go with anything you have. Try the pet beds at Lexie Lew. Based here in NYC, Lexie Lew not only makes stylish and comfortable pet beds (round or square), but they also give you the option of purchasing matching throw pillows for your sofa or bed!! What a great idea!! And the fabric choices are so chic and kinda retro. Lexie Lew pet beds not only come with a removable machine-washable cover, but there is a secret snuggle compartment in each bed! It is perfect for those pets that love to sleep under the covers. (Like a little baby kangaroo!) If your pet sleeps above the covers, you don't even have to know that the pocket is there!